The Kentucky Derby is one of the most popular sporting events for people to attend live. Fans from across the country travel to Louisville on that first weekend in May to see the best horse race in the world. The most common question we are asked by customers is “where should I sit?” We put together this handy seating guide to provide some insights on where are the best places to sit at Churchill Downs. Where to sit at the Derby? The Kentucky Derby is one of the only sporting events where the higher you are from the field of play, the more luxurious and premier your seats actually are. At Churchill Downs you will find a few options: Grandstands, Clubhouse, Dining, Suites and Infield General Admission. Then there will be 3 types of seating available at the Derby; bleacher seating or benches with no back support, stadium seating tip-ups with a back, and box seating which are seats that fold up/out. Bleacher seating and stadium style seating is pretty self explanatory. Please see below for box seating information. Box seating is found in the clubhouse seating area and third tier grandstand. These small boxes typically contain 6 folding chairs. Boxes on the third-tier level under cover will include 8 chairs. The chairs are able to be moved around as leg space is limited. If you are sharing a box with friends, this makes it easy. If not, you will likely have to work the chair and space logistics with your likely charming neighbors. This level of the track is the best area to sit in. Period. 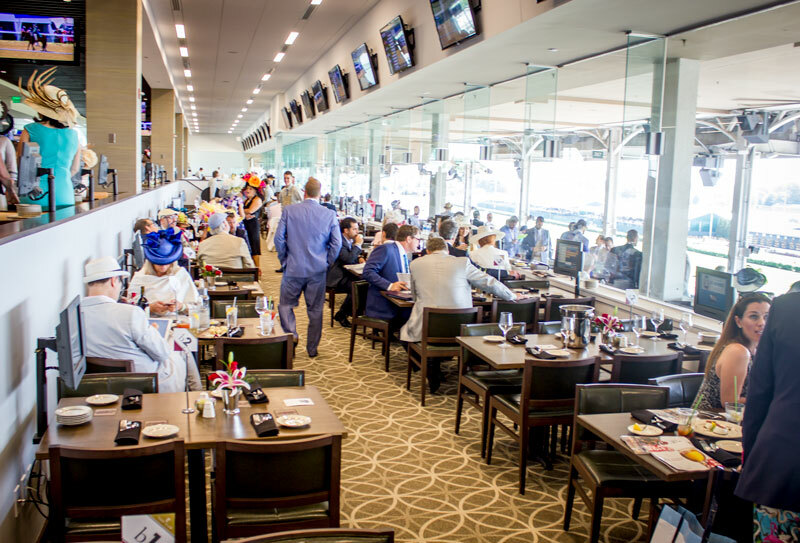 Filled with celebrities and those deeply involved in racing, bars exclusive to those with third tier level seating and above only and boxes with their own betting screens, it is one of the best and most highly recommended seats at the Kentucky Derby. Also – It does not cost NEAR as much as the Turf Club Seating. One of the main features people love the Clubhouse seating are the amenities; there are nicer food and drink choices, it is not as crowded as grandstand area, and there are more betting booths accessible. Now that we’ve discussed the three areas to sit and the types of seating available, here is a run through of all of the seating options available to you. 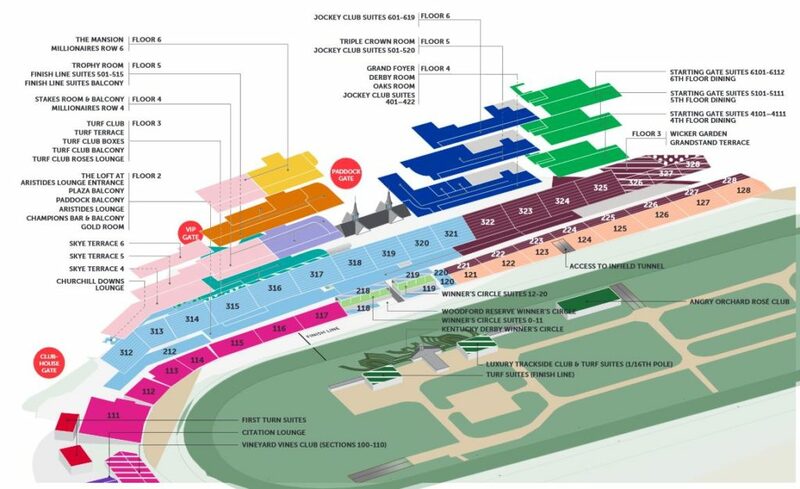 Churchill Downs is an intricate and confusing seating guide for those who have never attended. To keep this as simple as possible, TicketCity has used historical pricing to work from the cheapest seats on average to the most expensive seats on average. The Infield/General Admission: General Admission seats include access to the Infield, the paddock area and standing room only areas. The paddock is one of the most heavily trafficked areas by early afternoon making it very difficult to stand, meet up with friends or family or just hang out. There is no seating or views of the race. However, if you’re just looking for an opportunity to see the track, walk around and enjoy the festivities for a very low cost, this is your place. These also include access to the Infield; this area is not one we would describe as “family-friendly” and if you do some research on your own through YouTube videos, experience articles & blogs or a simple Google Image search, you can see why. It’s a giant party. It’s clean and fun at first but by the end of the day turns into muddy, dirty and not so enjoyable.The average ticket price is usually around $75.00. You can purchase General Admission/Infield Tickets Here. Lower Grandstands on the 100/200 level. The lower grandstand seating is located along the stretch of the track that approaches the finish line. The seating is completely composed of bleachers as shown below. Tickets tend to be reasonable but reasonable based on the fact that you’re sitting on bleachers for hours and everyone will stand during race. The cost might be high for bleachers but you have access to the bars and betting windows on the first and second tiers of the track. These tend to be the most crowded of any level on race day. You can purchase Lower Grandstands Tickets Here. 300 Level or 3rd Tier: This area of the track is comprised of box seating. Some with fold-out chairs and boxes seating up to 8 and then others that were discussed above that are clubhouse box seating that also have fold-out chairs, typically padded and your own betting screen. This is a dressy level of the track and will be more pricey but not as expensive or over-the-top as the levels above. This includes; Grandstand Level, Section 110, Turf Club, Millionaire’s Row etc. Since you are on the third tier, you are above the lower sections which gives you some of the best views of the race. Although the higher you are, the more status you have, this is the perfect mix of being elevated while still being in the sweet spot for enjoying the action. As I said above, it’s important to remember that up to Row C is not covered. So Row D is fully covered and Row E should be your sweet spot as sometimes those who walk through between C/D will be tall or have big hats on and will block your view. You can purchase 300 Level Tickets Here. Vineyard Vines Club Sections 100-110: Located on the first turn of the track, these seats come with a buffet and beverages. Yes, that includes alcohol so you can get a mint julep or 2! They include bathrooms, booze and a view of the horses as they come out. However, they are on the back side of the track near the quarter pole so only a few races go by. However, if you don’t mind watching a few races on the screen, just want to be there for the party and the experience, this could be your place to go. The Courtyard – This premium section was introduced in 2015, and it is located right in front of the owners’ suites. The section is considered “clubhouse” and is split into two sections (Sec. 118 and 119), divided by the Winner’s Circle and the paddock walkway. The seats are rows of padded folding chairs on a lawn. I sat in these seats for the 2015 Derby. Turf Club: Includes top-shelf open bar service and gourmet meal. The Turf Club is the top spot for the racing fan who wants to “see and be seen” on Derby Day! The Turf Club is a private members only area, however if you have a ticket on Oaks or Derby Day you will be a part of the high rolling action! Located indoors and climate controlled, the Turf Club overlooks the finish line area of the track. Tables typically seat 4 ,6, or 8 people. The majority of celebrities attending the Kentucky Derby sit in the Turf Club. A very nice meal is included in addition to your drinks (including premium open bar service). You can move around just about anywhere on the 1st, 2nd, or 3rd floors at the track as your ticket gives you exclusive access. You are in the height of luxury and class if you hold this ticket on Derby Day! You can view Turf Club Table Options Here. Millionaire’s Row: Premium indoor dining room seating at tables of 8* as well as access to a private viewing platform with views of the entire track and finish line. This is an area of the track typically for residents of Louisville or serious racing fans. Imagine a quiet banquet room with betting stops and removed from the craziness and party from the derby. Usually has a much older crowd and is considered the reserved area of the track. You can purchase Tickets on Millionaire’s Row Here. You are able to park in the neighborhoods surrounding Churchill Downs on the street or pay local Louisville residents for their driveways and walk to the track. Offsite parking is available at the Kentucky Exposition Center with round-trip transportation. The Transportation Center will be the site of continuous shuttle service between the Kentucky Exposition Center and Churchill Downs. The Transportation Center is located in front of the new Paddock Gate which is situated behind the saddling paddock near Central Avenue. This is a new gate that allows entry to the racetrack. Why Buy Your Kentucky Derby Tickets through TicketCity? TicketCity has been in business for almost 30 years and was the original online ticket marketplace. With experts on-staff who can help you make this the best experience possible, as well as a team on-site in Louisville to ensure your day goes smoothly, we strive offer the easiest planning process. If you have questions or concerns or would like to plan your derby trip through us, please reach out to us directly.